yes, i am a tattoed mom (i got all my tattoes before my pregnancy of course and planning to add more after finish breastfeeding) and i’m starting this blog as a present for myself and my family, especially my-nearly-5-months old son, bhumy. i want to record our domestic life here somehow as some kind of personal documentation. of course it will be filled with many things dealing with me son:) i might write in indonesian or english depending on my mood. my son, agastya asabhumy yasawisesa, was born on 14th july 2008, at 7.10 AM in bhakti ibu hospital of yogyakarta, central java, indonesia. we called him bhumy (thought mostly people call him with this short bum2:P). he was born 2,55 kg and 47 cm. healthy baby boy:) it was 2 weeks earlier than the doctor prediction. it was fast also, i’ll write about how he was born later. on 14th september 2008, my father passed away following my mom’s death 2 years ago. they’re really meant to be together always in that sense. my father only saw bhumy photos that i sent to him, but didn’t manage to see him in person (coz he was sick and we live in a different city). but i believe that both of them are loving their first grandson from whereever they are now:) anyway, this event made us (me, my husband-kadek and bhumy) to travel back and forth to my hometown, bogor and divide our time between yogya and bogor in this near future. we’re living with my brother in my parent’s house nowadays. our family now is in the transition to become vegetarian. for the last 2 years i have been a lacto ovo vegetarian, kadek had been an on and off vegetarian. we’re making stronger commitments since my pregnancy which seem that my baby since he was in the tummy is a natural vegetarian:) with this crazy weather and so many disease around, the 3 of us happens not to be catching anything for the past year. i’m back doing yoga too and basically lost around 12 kg since giving birth (another 4 kg and i’m back to before the bump era). it because i’m breastfeeding mostly and fully taking care of my son. i’m a writer, i mostly write fiction and currently seeking publisher to publish my short stories collection. i’m studying history which i still owe my campus a thesis. which i had to put off again for another year, with the family current condition. but totally fine with it, i’m not rushing on anything anyway. like now, enjoying my motherhood with my baby long night sleep after 10 pm by going online and making this blog. haha:D kadek is an artist from bali origin, he paints mostly neo surrealism painting, doing art installation and performance art. we’re a family from different mixed of culture origin. my mother had a chinese,sundanese and dutch blood, my father had java blood and a hint of chinese. 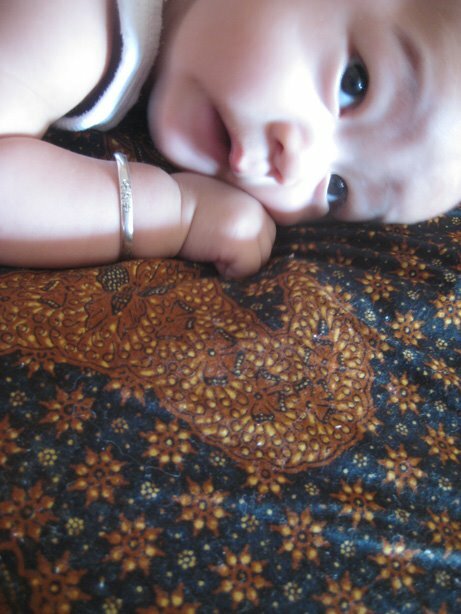 kadek is from bali, but his mom have a hint of chinese and indian blood. so bhumy is really mixed, he is:) which made him so adorable:) (yeah i’m totally in love and narcistic with my baby). by making this first post, i’m officially writing again (since i quiet lost it since my mom’s death, i had so many things in mind then and i’m digging it out now). of course though, this blog will mostly having my personal, informal things with my life and motherhood. the above picture is bhumy photo on kadek’s b’day (7 dec’08). he really likes being in this position now and learning to crawl and sit too. he’s laying on his batik truntum* which got chosen in his mitonan** ritual. ponakaaaaaaaaaaaaaaaaaaaan kapan engkau fulang kemari???? ?